Newly renovated Conference Centre with modern design and cutting-edge audiovisual technology. On a secluded cove, against a canvas of sand and sea, couples exchange vows at a breathtaking resort nestled on a 40-acre seaside haven. Boasting a secluded 500m pristine beach, lush tropical greenery and 470 well-appointed rooms and suites, Le Méridien Phuket Beach Resort offers dream weddings and romantic honeymoons in a place of untouched tranquility on the island's south western coast. 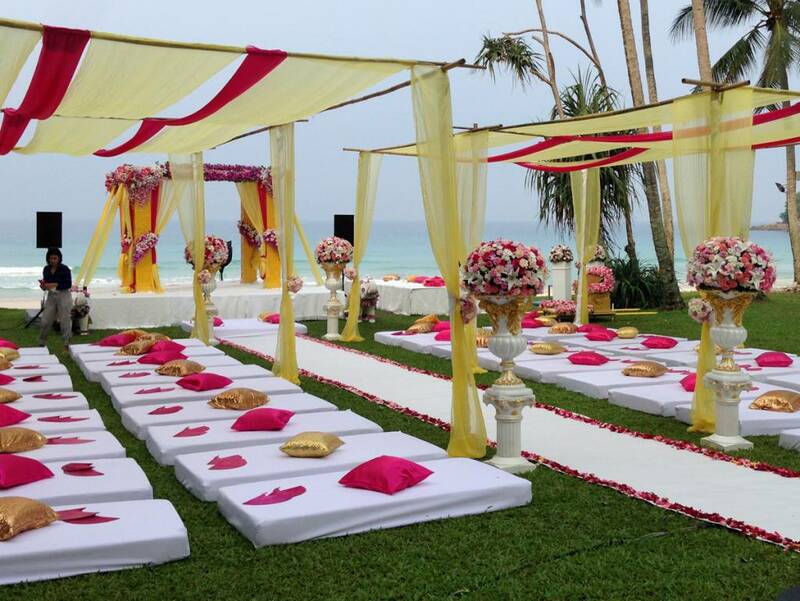 With over 1,310 sqm of floor space, the resort can cater to events of up to 980 persons with plenty of indoor and outdoor venue options. 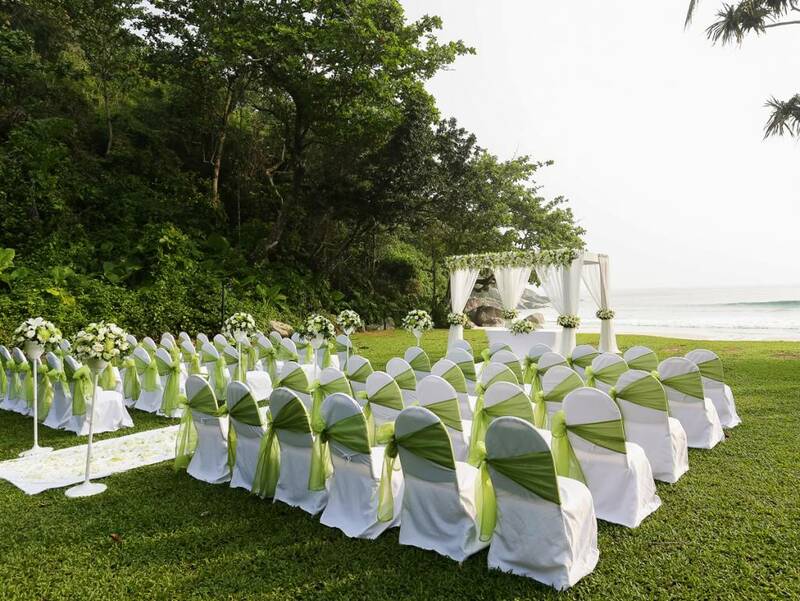 Many dream wedding ceremonies have been fulfilled here, a perfect prelude to a lifetime together made more romantic by breathtaking sunsets and lush tropical surroundings. 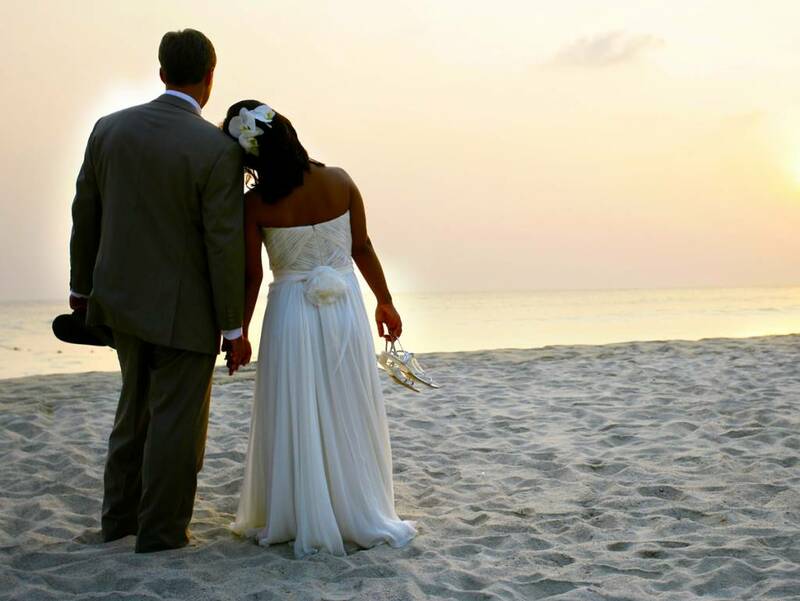 The resort is definitely perfect for honeymoons. Couples will be pampered for room choices - from Deluxe Garden View and Deluxe Pool View Rooms, Deluxe Ocean Terrace Rooms, Ocean View Junior Suites, Oceanfront 1-Bedroom Deluxe Suites to opulent Oceanfront 2-Bedroom Grande Suites. All these plus a complete range of land and water adventures, world-class spa, ten restaurants and bars, oversized swimming pools, and a fitness centre for a satisfying stay whatever guests' whims and fancy may be. For all its utter seclusion, Le Méridien Phuket Beach Resort is merely a five-minute drive from Patong and Karon, Phuket's entertainment and shopping districts. 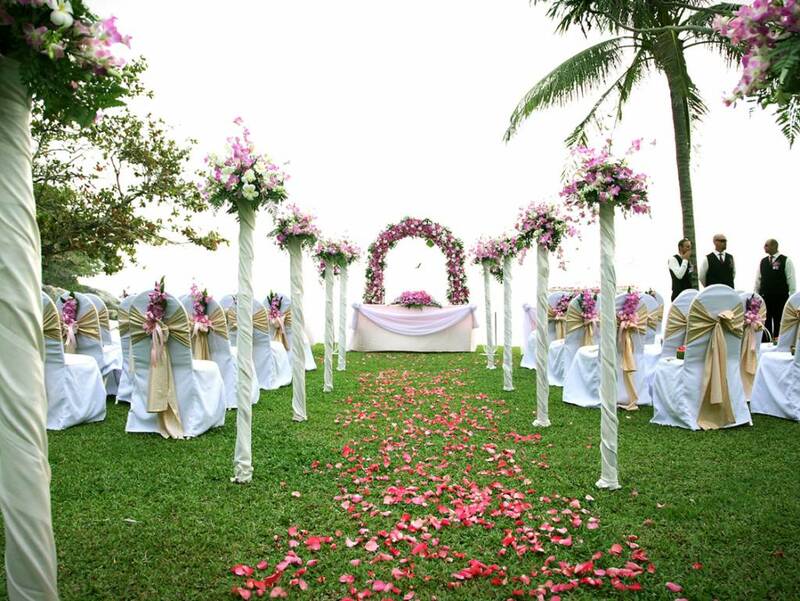 Includes decorative venue setup, entrance decoration, flower decoration, heart-shaped ice carving, sitting area and monk and temple coordinator. A wide variety of cocktails. Menus for sit down dinner or buffet style are available upon request. 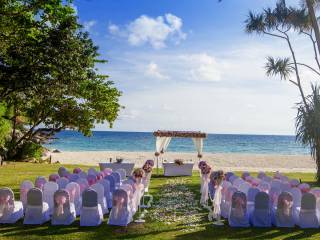 Includes Thai wedding ceremony as above, two hours massage for two persons, one champagne in-room breakfast for two persons, one private beach romantic dinner for two with a bottle of wine and a honeymoon turndown service on the wedding night. 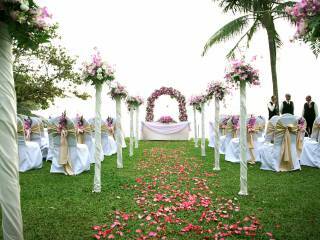 Includes decorative venue setup, entrance decoration, flower decoration, heart-shaped ice carving, master of ceremony, bridal bouquet and groom corsage, digital photographer service for three hours (100 pictures), and one wedding cake two pounds. 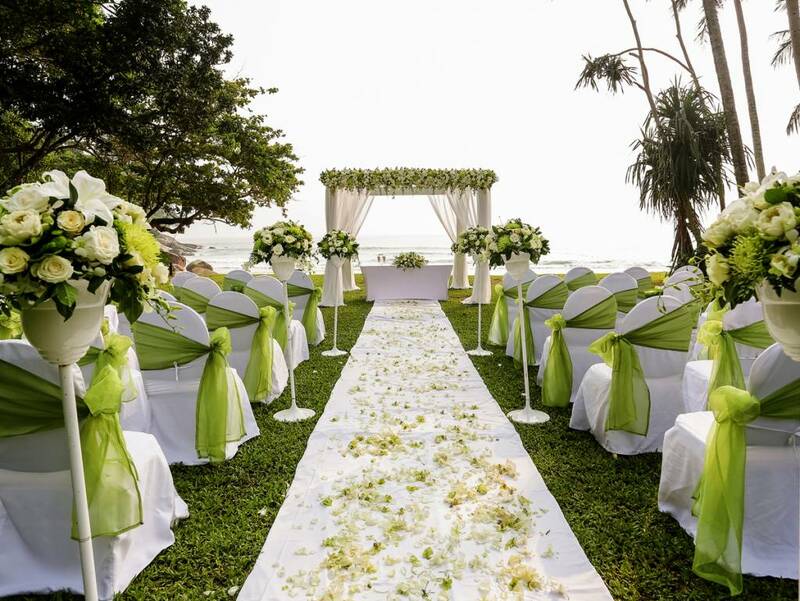 Locations are many and varied, from the panoramic view of the beachfront at the marquee to the tropical gardens surrounded by beautiful flowers or in the decorative function room. Includes Western wedding ceremony as above, two hours massage for two persons, one champagne in-room breakfast for two persons, one private beach romantic dinner for two with a bottle of wine and an honeymoon turndown service on your wedding night. All rates subjected to 10 service charge and 7 government tax. Sunset Bar Sunset bar 30 The perfect spot to while away the afternoon as the sun slowly sinks over the Andaman Sea.